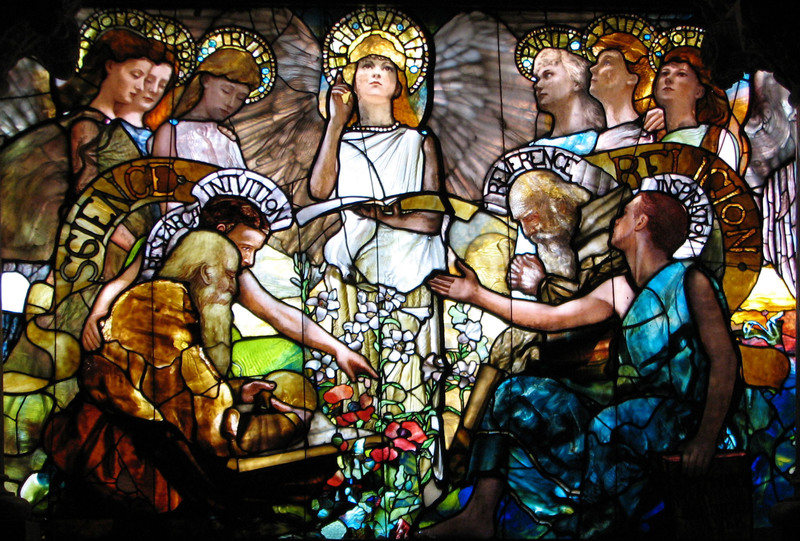 Science and Religion are portrayed to be in harmony in the stained glass window entitled Education by artist Louis Comfort Tiffany (1890). Some climate change skeptics similarly declared that Francis was inappropriately straying from his proper turf of religion into matters of science when the Pope released his encyclical letter Laudato si’ in June. Such calls for a strict separation of religion and science are common. But history shows that the effort to separate science and religion is a fool’s errand. They have not been, nor are they likely ever to be, separate. A society’s beliefs and values (religious and otherwise) are reflected in scientific activities, and the reverse holds true as well. The Catholic tradition provides centuries of examples of this truth, though we could say much the same for other faiths. Religious motives have long propelled scientific work. A thousand years ago, Pope Sylvester II was renowned for his learning in mathematics and promoted its study, in part based on Islamic texts he had studied in Spain. Four centuries ago, during the Scientific Revolution, Francis’s own religious order, the Jesuits, were deeply involved in cutting-edge astronomical research. And today, the newly appointed director of the Vatican Observatory, an American Jesuit named Guy Consolmagno, holds advanced degrees from MIT and Arizona State University and specializes in the study of meteorites. Then and now, science can be part of a religious calling. At the same time, there are also atheistic scientists who see their work as part and parcel of their beliefs – or, in this case, their unbelief. Beliefs and values also influence scientific practices. As the Middle Ages gave way to the early modern period in Europe, human dissections could be associated with holiness, as the corpses of potential saints were regularly evaluated for bodily signs of divine favor. But dissections could also be seen as a disrespectful treatment of the body, and so the bodies that were examined in the growing number of university anatomical theaters were often those of outsiders and criminals rather than upstanding members of the community. Today, scientists’ use of primates or fetal tissue provoke not dissimilar debates over the propriety of particular scientific methods. Arguments over potential responses to climate change turn in part on questions of what we owe future inhabitants of the Earth versus our present-day fellow travelers. The very questions that scientists ask are influenced by the society in which they live: Can scientists explain evil, or why life exists? Should they try? Scientists’ findings also overlap, like it or not, with religion. Biologists, physicists and psychologists explore the nature of life, the origins of the universe and the operation of the mind – all topics overlapping with religious belief, ethics and morality. And one can only imagine how the discovery of sentient life elsewhere in the universe would affect us in these matters. Ultimately, science – its practices, its practitioners, the questions that they ask and the answers that they give – is deeply, inevitably enmeshed in the society in which it occurs. Sometimes we can fool ourselves temporarily into thinking that our scientific ideas are different from our religious ones. But then a question comes from a new direction – a pope issues an encyclical on climate change, for example – that reminds us that such divisions are illusory. The central question, then, is not whether science should interact with beliefs and values or vice-versa, but what, or rather whose, values science will reflect. This struggle has animated many of the arguments about science and religion down through the years. It certainly seems to have animated Rep. Gosar, who does not like the values reflected in Pope Francis’s discussion of climate change. Ultimately, because we cannot disentangle science and society, we must instead recognize their complicated connection. Then, with that recognition we must, individually and collectively, find the best ways to pursue knowledge and take action. Jonathan Seitz, PhD, is an associate teaching professor of history and director of undergraduate studies in Drexel’s College of Arts and Sciences. Members of the news media who are interested in speaking with him should contact Alex McKechnie at ahm62@drexel.edu or 215-895-2705.